One of the original supermini’s, the robust Punto is a clear favourite in Europe and just perfect for negotiating those narrow, winding streets. A great performer in the city, parking is easy and it’s nippy enough to get you from A to B in no time at all. Launched back in 1993 as a replacement for the aging Fiat Uno, the Punto became an instant classic for its chic looks and low running costs. Voted European Car of the Year in 1995, it became a popular sight on Britain’s roads and remains so almost twenty years later. This swift little hatchback is ideal for smaller families, new drivers or if you’re just looking for something smaller and cheaper to run. Comfortably fitting three in the rear, it’s more than a supermini. Head and leg room is surprisingly plentiful making longer journeys a pleasure not a pain. With a decent sized boot and split and fold rear seats, it’s got everything you need at a price you can afford. A worthy competitor to the class leading Ford Fiesta and the solid VW Polo, the Punto is a sportier option and an excellent contender in this class, where space and performance are key. Available in three-door and five-door versions and with a choice of Active, Active Sport, Dynamic, Sporting and Eleganza trims, you can expect a return of around 45-50mpg from the 1.2 litre petrol engines. Spend a little more and you’ll see over 50mpg from the efficient 1.9 diesel engines. Or, take a look at the recently remodelled Punto Evo with its curvy lines and economical start/stop engine that’s a standard feature on new models. The new MultiAir engine is powerful while reducing fuel consumption thanks to the cutting edge electrohydraulic engine control, offering a much more responsive ride. Choose a higher spec and you’ll also get the innovative Blue&Me system, for hands-free calls and texts MP3 compatibility. 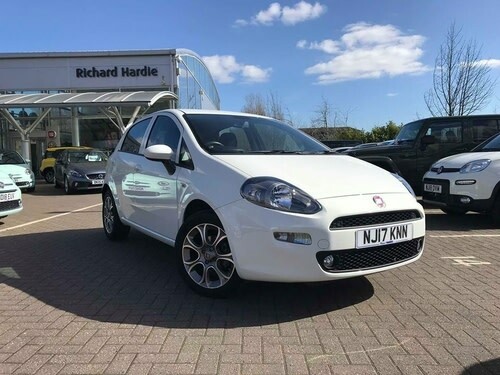 If you need a sporty little hatch to get you around in style, take a look at the economical Fiat Punto for a truly versatile and reliable city car.